The comedy geniuses at digital network Above Average have released a glorious sendup of gentrification in New York City's outer boroughs. 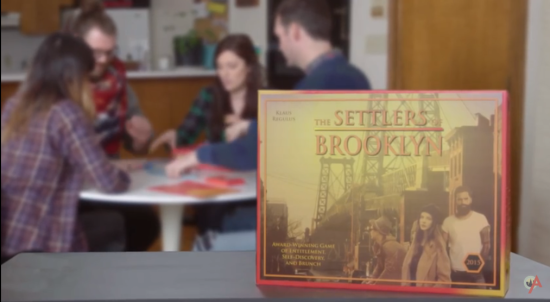 "Settlers of Brooklyn" (pronounced Brook-LAWN) promises hours of good old-fashioned board-game fun for the next generation of power brokers: millennials. A fictional update of "Settlers of Catan," "Settlers of Brooklyn" similarly encourages players to civilize Williamsburg and its surrounds by collecting resources and converting them into development—where "development," in the new context, equals upscale, hipster-oriented growth. "In the early 2000s, the land of Brooklyn was virtually uninhabited by young adults with wealthy parents," begins the voiceover. "Your goal is to be the first player to create a fully gentrified colony filled with used record stores, food trucks, and Urban Outfitters." Every aspect of "Settlers of Brooklyn" is tongue-in-cheek, from the lineup of resources—coffee, bicycles, vinyl, skinny jeans, and kale—to the prizes rewarding players on their way up—condo conversions and intangibles like "longest brunch." Development cards include "loan from Daddy" and "grad school," and a player who rolls the number seven can use the "realtor" piece to displace existing residents "to make room for more colonization." ("I hope they open a gym there," said the player demonstrating the move in the faux-mercial.) The corresponding piece in the original "Catan" is, of course, "the robber." The winner of "Settlers of Brooklyn"—the first player to 10 points—is "crowned Lena Dunham." Worried the fun stops there? 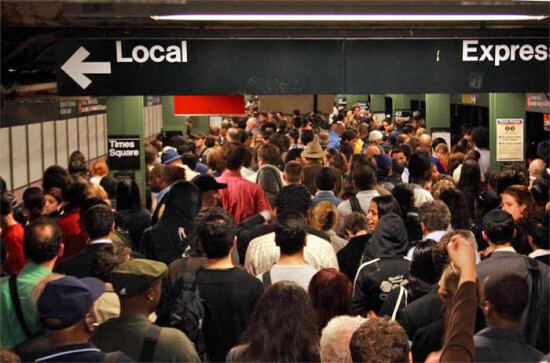 Have no fear; the video promises expansion packs for Harlem and Astoria. 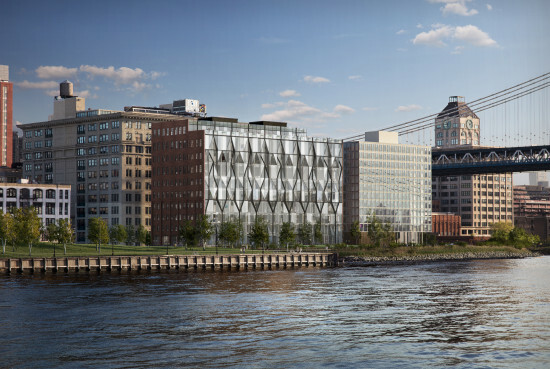 The New York City Landmarks Preservation Commission has given its blessing to ODA's jewel-like faceted facade for a factory-to-condo conversion on the Dumbo waterfront. 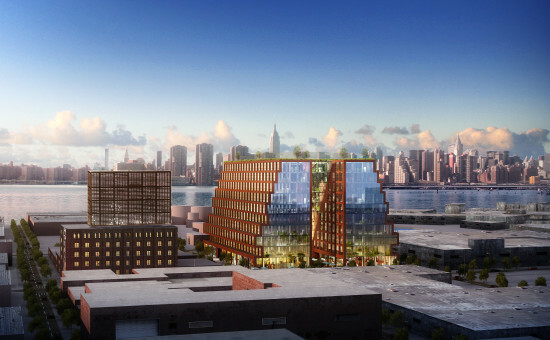 The firm first presented its plans for 10 Jay Street last month, and while it was well received, commissioners didn't think the dramatic, glassy design was a perfect fit for the historic neighborhood. So the firm took that into account and added more steel and brick elements into its design. And with that—permission was granted. Curbed reported that the sugar crystal-design of the facade was inspired by the building's history as a sugar refinery. The commission had previously approved ODA's plans to restore the building's other three sides. Check out the fly-through below to get a better sense of the design—albeit, the earlier version of the design. https://www.youtube.com/watch?v=hlLQ6DLy44c According to the Real Deal, demolition is slated to start May 1 and completion is planned for Fall 2016. 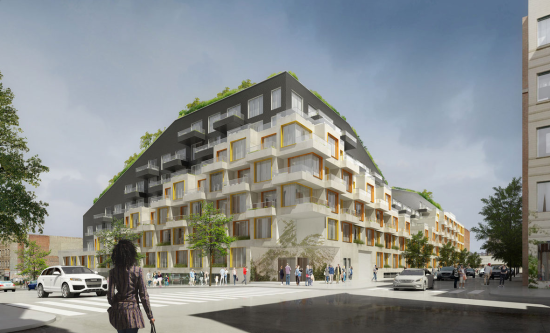 ODA has unveiled renderings for a massive new residential complex in Bushwick, Brooklyn—and it certainly reminds us of Bjarke Ingels’ 8 House in Copenhagen with its doughnut-like shape and landscaped roof that dips toward the street. 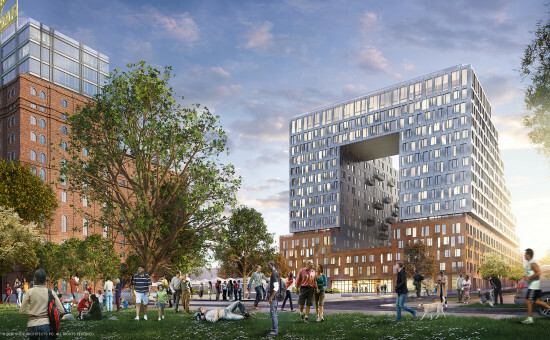 At nearly 400,000 square feet, ODA’s 10 Montieth Street will become a major piece in the redevelopment of the Rheingold Brewery site. The 392-unit rental building is quite obviously geared toward younger tenants that have been flocking to the neighborhood in recent years. 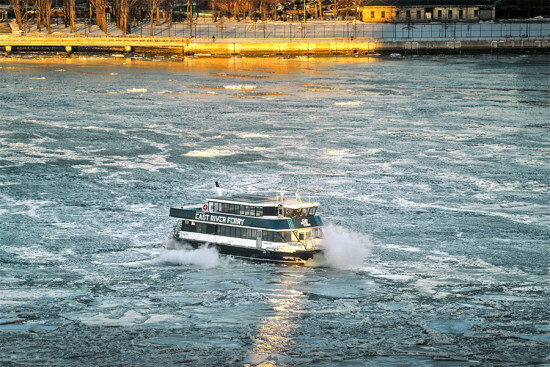 Above the building’s apartments—most of which are studios or one-bedrooms—is that 25,000-square-foot roof, which packs more amenities than a three-day Carnival Cruise. According to the Real Deal, 10 Montieth’s zigzagging roof has a “running/hiking course, urban farming areas and an outdoor cross-training facility.” There is also apparently a “chill space” and some graffiti walls so renters can take the edge off if urban farming isn’t going as planned. 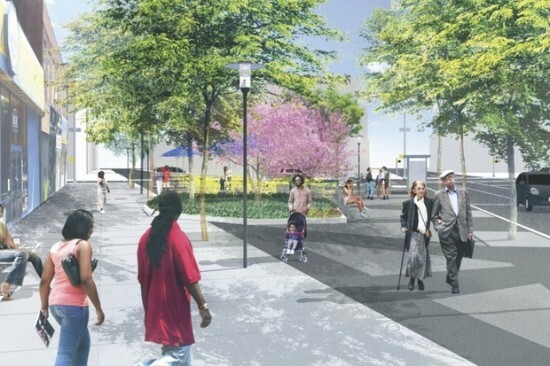 They could also probably use the 19,000-square-foot courtyard as a “chill space.” Good to have options. The building’s protruding volumes and balconies give it the boxy design aesthetic we have come to expect from ODA. The geometric exterior is primarily clad in light gray stone or concrete and has pronounced orange window frames. ODA adds contrast to the project by using darker materials on the sections of the building that are set back from the street. 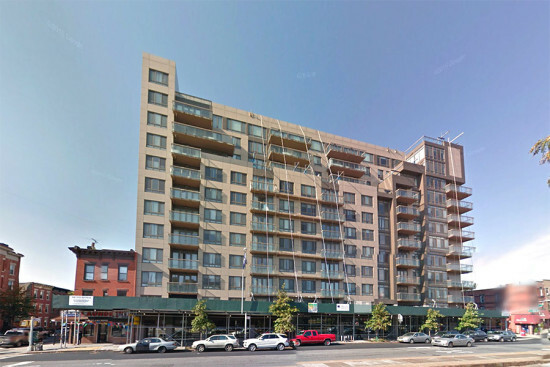 Many of the new condominiums erected in Brooklyn during the last building boom are not aging well. The New York Times reported that “[w]hen the housing market collapsed in 2007 and coffers ran dry, many developers were left scrambling to complete projects. 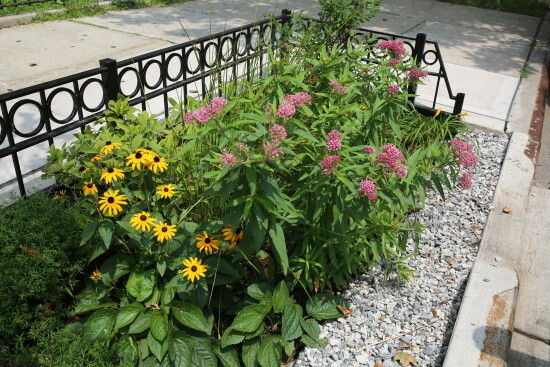 Some cut corners or abandoned developments, leaving others to finish the work.” This led to poorly constructed buildings and angry residents who are stuck dealing with mold, cracking balconies, and flooding. 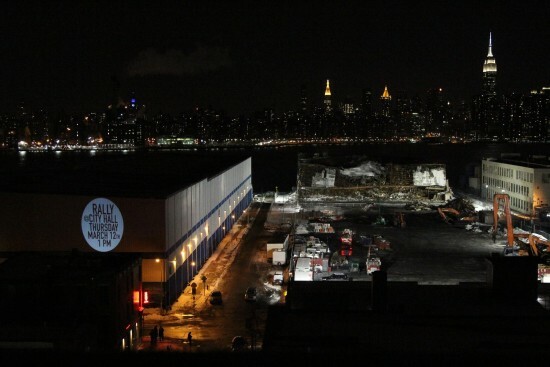 One such building even saw part of its facade fall off. Now many of the developers behind the shoddy buildings are breaking ground on new projects, hopefully with more attention to quality.